After three years of (semi) regular existence, it is now high-time that the Pervasive Labour Union zine takes a very close look at the universe of the alternatives to corporate social networks. What do these alternatives look like? What are the requirements of a &apos;true&apos; alternative? The Pervasive Labour Union zine already broached some of these topics on its Special Issue with the Homebrew Server Club on XMPP. To follow the HBSC’s strategy, a premium should be put on alternative approaches, not on any specific alternative apps. We need federated social networking solutions based on open standards that are able to communicate among themselves, regardless of the platform being used. Which protocols can and are being developed to achieve interoperability between the different alternatives? How do scale and trust influence the field? What are the forces at play within this realm and how to engage with them? With this issue, we propose not only to collect a field guide of sorts, but also to open up the discussion on the alternatives and how to tackle the challenges posed by network effects, scalability and financial viability. How Circular Is The #Circular #Economy? 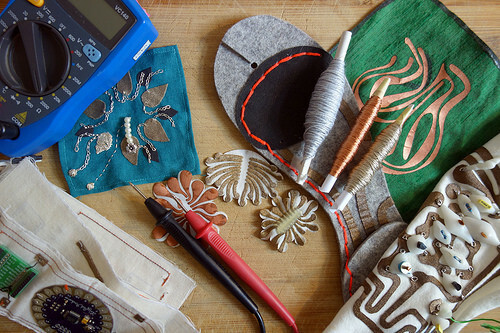 Before closing our E-Textile Tailorshop shop at the end of January next year, we want to offer a week-long Winter School to pass on these skills to a group of interested people. Deadline for applying is Wednesday November 14th 2018.